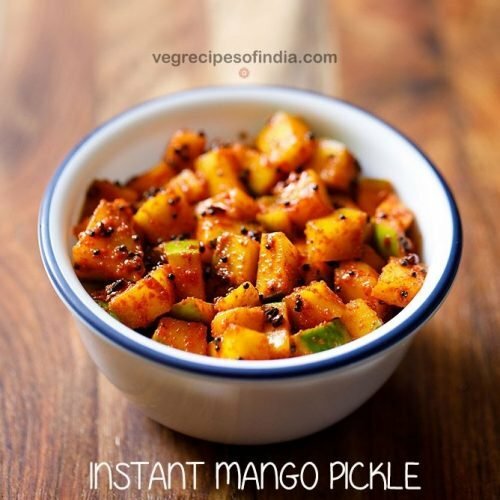 kerala style instant mango pickle recipe which is super easy to make. kerala style instant mango pickle recipe with video and step by step photos – this instant mango pickle recipe is quick and easy to make. the pickle is prepared with raw unripe mangoes, mustard seeds, curry leaves and some spice powders. i have learnt this recipe from my mom. best part of this pickle recipe is that it can be made in less than 15 mins. 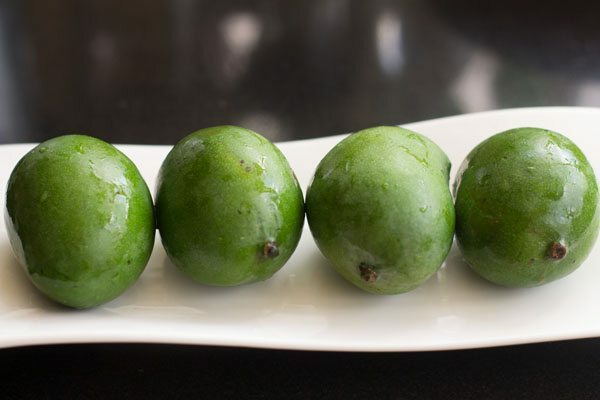 in the step by steps, i have used 4 small green mangoes which together weighed 300 grams. in the video, i have used one large mango which weighed about 300 grams. depending on the size of the raw mangoes, the number of mangoes will vary. so when you chop the mangoes, you should get about 1 to 1.25 cups of chopped mangoes. you can also easily increase the quantity of the recipe by doubling the ingredients mentioned in the recipe card below. pickles are favorite in our house be it lemon pickle or green chili pickle or lal mirch ka achar. 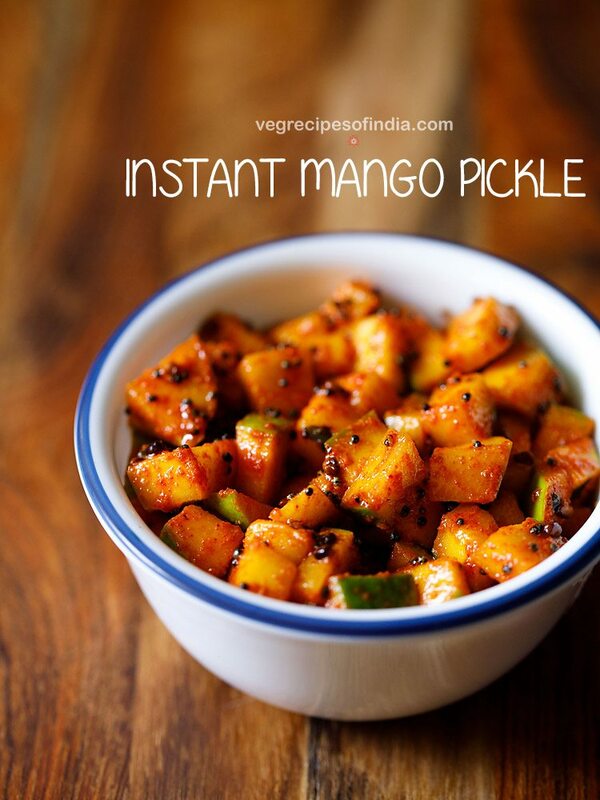 personally i love this mango pickle as its made quickly and can be made in small quantities. 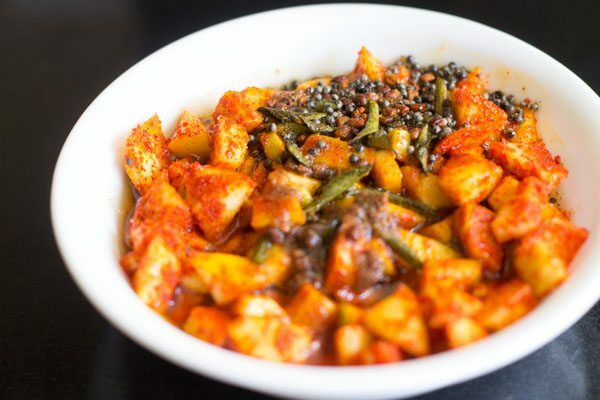 mango avakaya recipe (popular mango pickle from andhra pradesh). pickles go great as a condiment or side dish along with dal-rice, veggies or pulao. in fact some people even love to club pickles with rotis, methi thepla and paratha. i remember some of my school mates getting theplas and pickle in their lunch boxes. 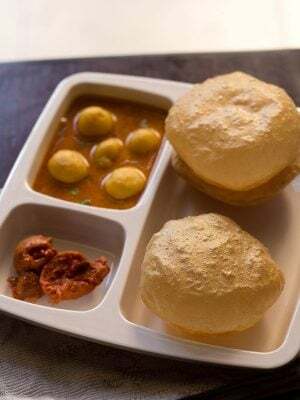 also not to forget how much we used to enjoy eating this combination of pickle and theplas in school. since mango season will fade soon, i thought of making this instant pickle. this pickle also doesn’t require any sunlight or much of cooking process. so this mango pickle could be made any day during the mango season. at room temperature, this will last for 1 to 2 days. if you directly keep in the fridge after the pickle is prepared, then it will last for about a week. 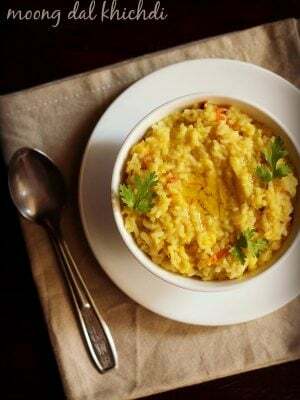 serve this kerala style mango pickle with dal-rice or curd rice or dal khichdi or sambar sadam. i have updated the post with a quick video. keep all the ingredients ready for the mango pickle. rinse the mangoes and then dry them with a clean kitchen towel. there should be no trace of moisture on the mangoes. peel their skin. to peel the raw mangoes are optional. chop the mangoes into bite sized pieces or cubes. chopping is a bit tough, so use a good knife and be careful of your hands. the chopped raw mangoes should be about 1 cup. place them in a mixing bowl or wide dish. 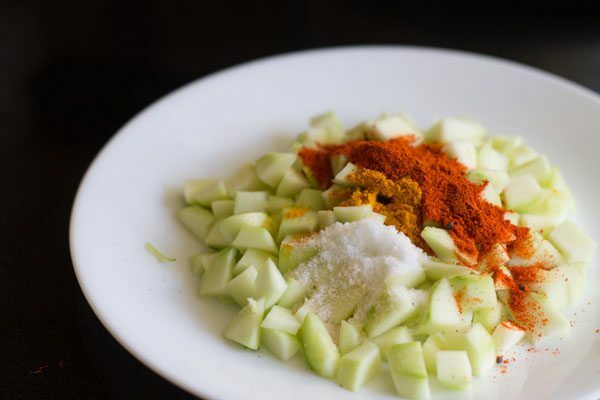 sprinkle 1 tsp turmeric powder, 1 tsp kashmiri red chili powder and salt on the chopped raw mangoes. mix all of them nicely with a spoon. the masalas should nicely coat the chopped raw mangoes. 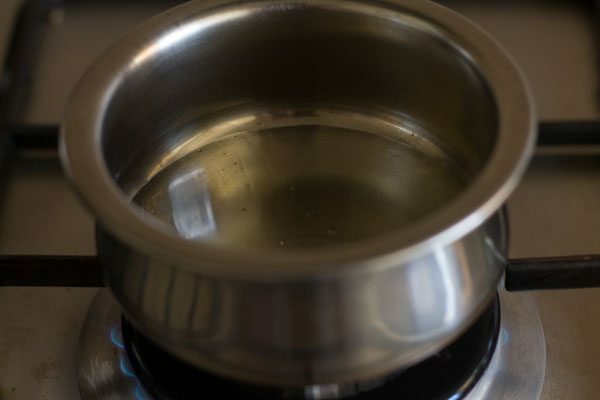 heat 4 tablespoons sesame oil in a small vessel or tadka pan. 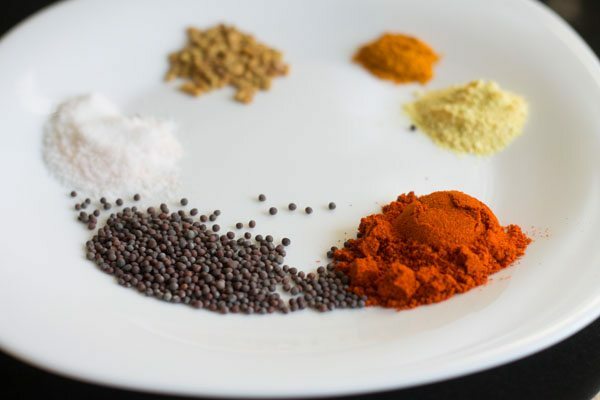 add 2 tsp mustard seeds, 1 tsp fenugreek seeds and ½ tsp asafoetida. once they start crackling, add the curry leaves. 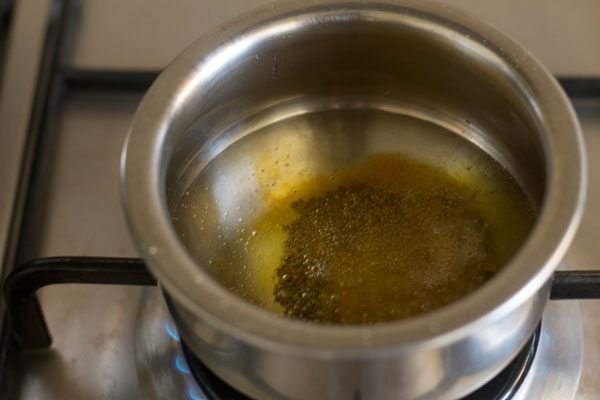 pour this hot tempering or hot oil mixture over the masala coated raw mangoes. allow to cool and store mango pickle in clean, sterilized glass bottles. 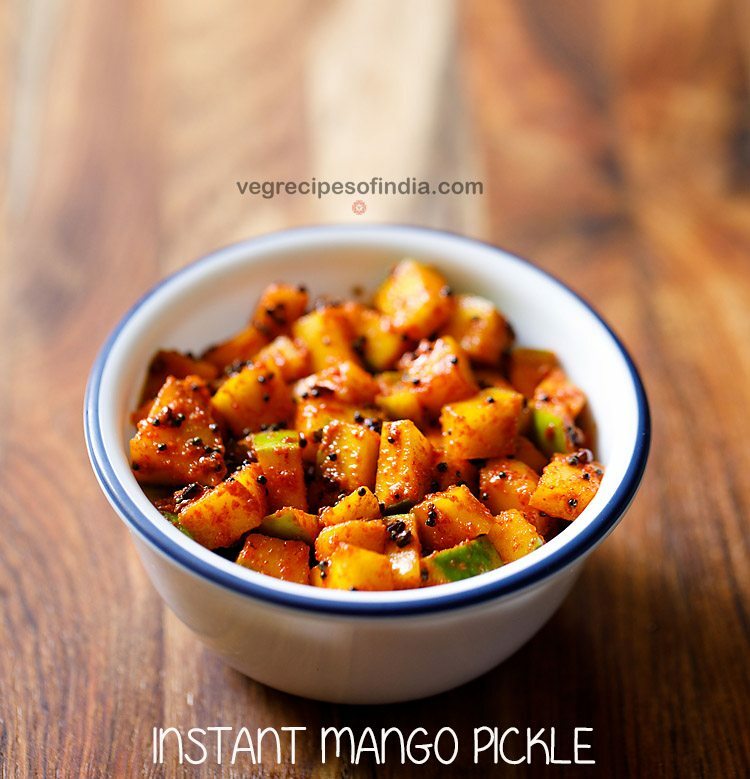 the instant mango pickle is ready, serve them as a side dish with your favorite meals. 1. keep all the ingredients ready for the mango pickle. i prefer to keep everything handy as this fastens the cooking process. 2. rinse 4 small (300 grams) and then dry them with a clean kitchen towel. there should be no trace of moisture on the mangoes. in the video above, i have used 1 large mango which weighed about 300 grams. whereas in the step by step pics, i have used 4 small mangoes and they weighed 300 grams in total. 3. peel their skin. this is an optional step. 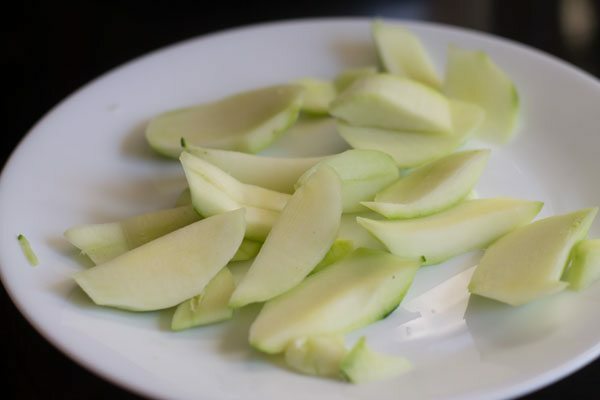 4. chop the mangoes into bite sized pieces or cubes. chopping is a bit tough, so use a good knife and be careful of your hands. chop them into cubes. the chopped raw mangoes should be about a cup. place them in a mixing bowl or a wide dish. 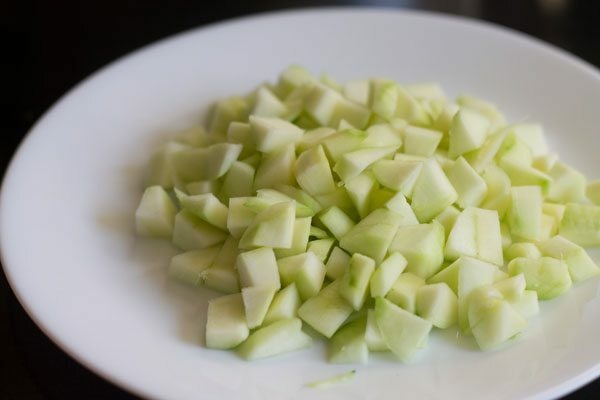 after chopping, you should get about 1 to 1.25 cups of chopped raw mangoes. 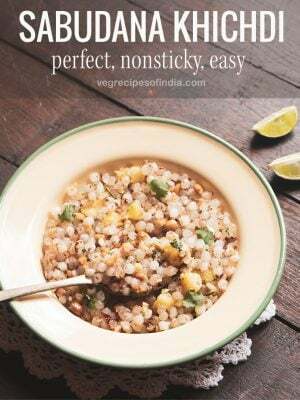 5. sprinkle 1 teaspoon turmeric powder, 3 teaspoon kashmiri red chili powder and 1 teaspoon salt on the chopped raw mangoes. if you want you can reduce the kashmiri red chilli powder for less spiciness. 6. mix everything nicely with a spoon. 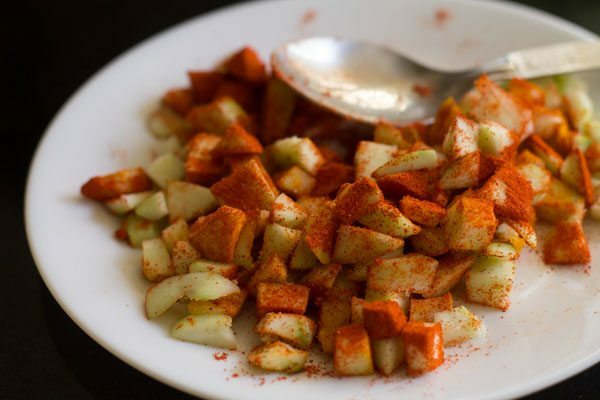 7. the masala should nicely coat the chopped raw mangoes. take the mangoes in a heat proof bowl. 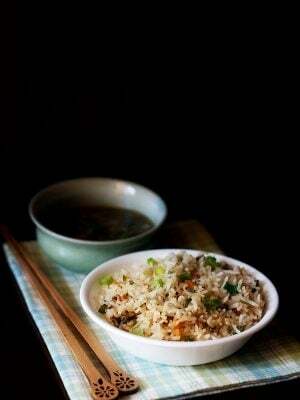 8. heat 4 tablespoons sesame oil (gingelly oil) in a small vessel or kadai. you can also use mustard oil or sunflower oil. 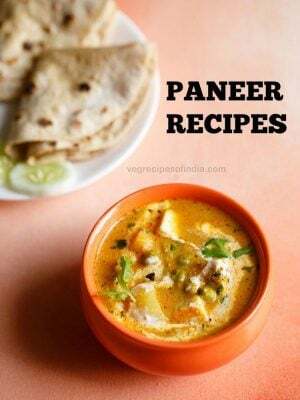 9. add 2 tsp mustard seeds, 1 tsp fenugreek seeds and ½ tsp asafoetida/hing powder. 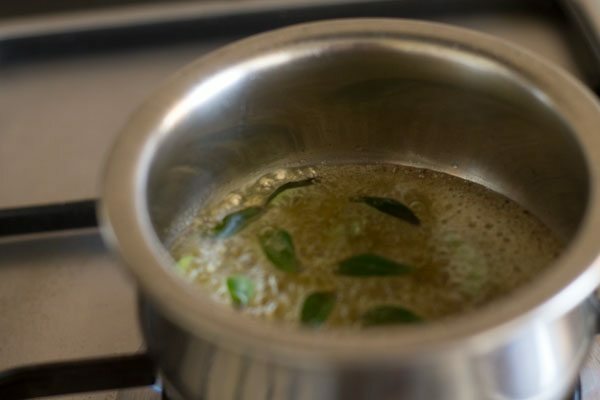 10. once they start crackling, add 8 to 10 curry leaves. fry for 1 to seconds and then switch off the flame. 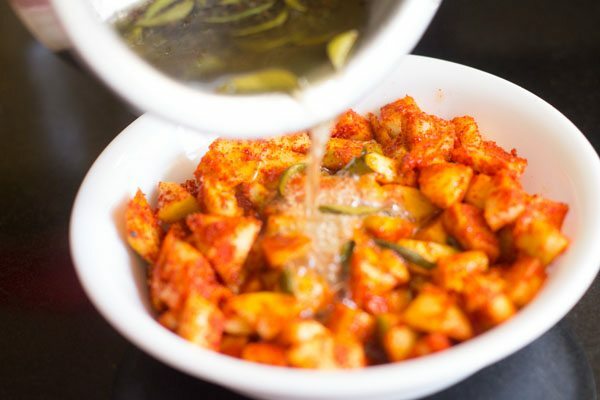 11. pour this hot tempering or hot oil mixture over the spiced raw mangoes. 12. mix everything very well with a spoon. 12. allow mango pickle to cool and store in a clean, sterilized glass bottle. instant mango pickle is ready. 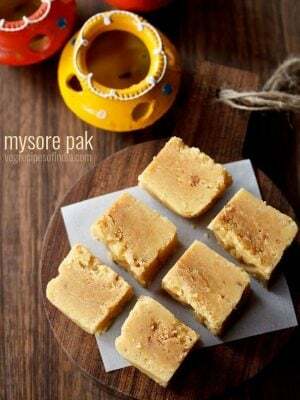 serve this kerala style mango pickle as a condiment with your favorite meal like curd rice or khichdi or sambar rice or vegetable pulao or vegetable biryani. refrigerate the pickle for later use. thank you so much for your recipe, I just made it, had to tweak it a little, but its awesome, keep up with sharing the love! thanks tilly and glad that you liked the mango pickle recipe. happy cooking. fenugreek seeds when raw are hard. but when you fry them, they become brittle and can be eaten. same is when you cook them in a dal or gravy, they soften. i guess they needed to be fried for some seconds in the oil. you wouldn’t have felt them to be hard. hope this helps. Thanks Dassana for this simple yet tasty mango pickle. 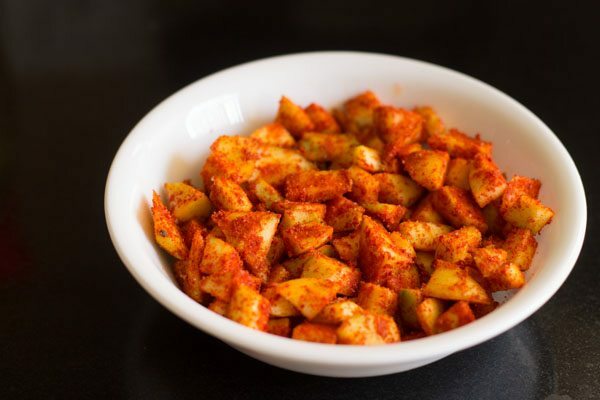 Do you have a recipe for shredded mango pickle. We call it maagaya pachadi in telugu. Also I have sun dried mango pieces(salted). I would like to do a experiment with how this recipe is. If you have any suggestions please let me know. pavani, i do not have any recipe of shredded mango pickle. even i have sun dried salted mango pieces. these are known as manga vathal in tamil. 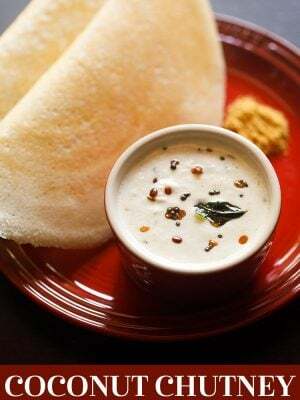 in south indian cuisine they are used to make kuzhambu. in goan cuisine mango pieces as used a souring agent for goan fish and prawn curries. for a quick pickle recipe, you can soak the pieces in boiling hot water and then temper with chilli powder, turmeric powder, hing in sesame oil (gingelly oil) and use as pickle. 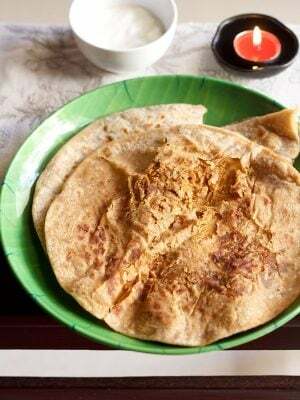 you will be surprised that it tastes good with curd rice. You have lot of mango pickles and I am lost again. I didn’t know in which pickle recipe I commented. I’ll try the way you suggested. I love mango pickles anyway and any time. You are making me post comments(I didnt post any for anyone else) where I’m unable to resist myself. Please update your website so we can get notifications for our comments when you reply. It’s really helpful for many of us. Sincere request. pavani, you have commented in this instant mango pickle recipe. we had the notification option before, but many readers started complaining. i used to get emails from readers requesting me to stop the notification. so we have removed this function now. I have made this today. Super yummy. Thanks for the easy receipe! How long can we store this? Can it be refrigerated? its stays well for a week or about 10 days in the fridge. I made this! super easy and delicious. I am so proud of me today.Thank you so much. I love your recipes. welcome rinku. thanks for sharing positive feedback on mango pickle. This is such a mouth watering recipe, will make this first thing tomorrow morning Canada time. I am a huge fan of your recipes as always! surely try mala and let us know how the pickle was? thankyou.